Sounds like he’s trying to sell them a house. Sounds like a money pit. Maybe bodies in the basement or attic? 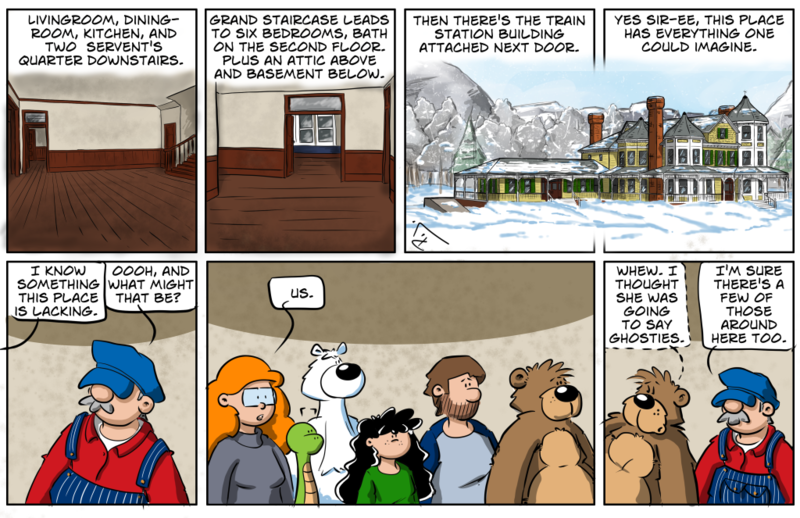 What kind of old abandoned train station doesn’t come with ghosts? That’s like a prerequisite condition of occupancy. It’s on the MSL listing i’m sure. Grogan, Grogan, where have I heard that name before? How trustworthy can someone with that heritage be? I’d be careful, no ghosts, but might be a few Leprechauns hiding about. Apart from the ghosties it sounds like the place is perfect. Or did Duffy mean to say Toasties? Does sound great. There has to be a catch somewhere… right? Right. Duffy turns on stove to pan fry some toasted sandwiches. Forgets stove is on. Burns sandwiches, burns down building. A nice quiet haunted train station. Good answer. I’ll go with that.